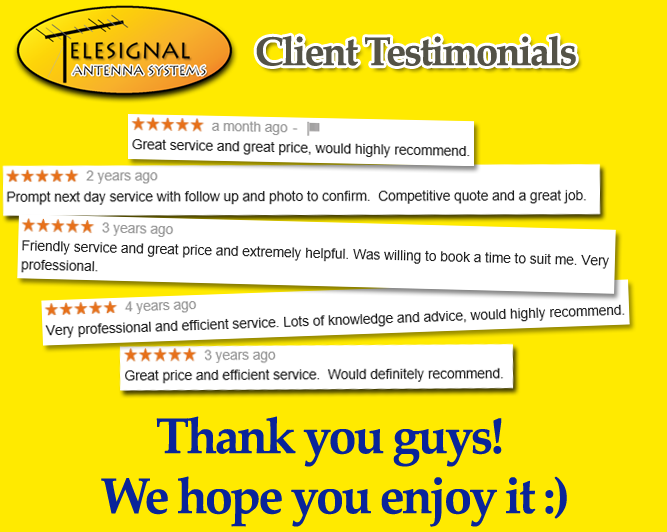 Telesignal can help you with clearer TV picture, Antenna installations and more! 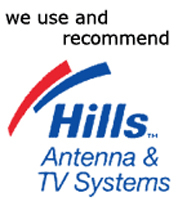 Using quality Hills Antennas and top standard cabling, we have solutions for areas with good or poor TV reception. 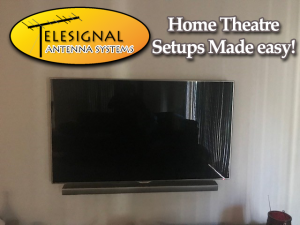 Professional TV mounting and setting up your new home threatre system to make sure you get the best quality entertainment. Troubleshooting TV reception problems, antenna inspections, and checking your signal strength - we'll find the solution. Is your entertainment system letting you down? Do you struggle to get a “clear TV picture” for your favorite shows? Don’t put up with lackluster entertainment, or even worse risk doing the antenna installation yourself! Telesignal Antenna Systems can put the pizzazz back into your TV at prices to please your wallet. 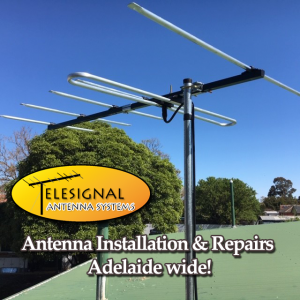 Telesignal Antenna Systems is a family-run company and we specialize in digital TV Antenna installation Adelaide wide. Our fast and reliable service at affordable prices means you will be watching high quality TV and entertainment from your home sooner at a price that won’t damage your budget. Need TV Antenna Installation or repairs? We’ll put the extra Antenna point wherever you want it. On the wall in front of your bed so you can mount the tv on that wall and watch TV as you fall asleep at night, in the patio or Garage so your eldest son can have a hide away spot, its up to you, we’ll do it affordably with no trouble at all. Few people might know this TV Reception booster method. 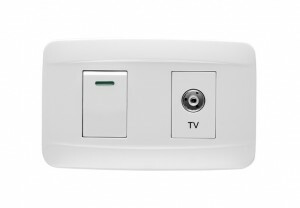 An antenna amplifier gets connected to your “antenna to TV” circuit and helps boost the UHF/VHF signal reception coming from the radio and TV Stations. Sometimes this method will help with minimising pixilation errors that occur on digital TV screens due to weak signal reception or interference from weather conditions. Sometimes an antenna reception problem may start due to corrosion or loose connector on the Antenna itself. Socket points on you wall can also become looser due to age and cable stress passed onto the socket point. All these issues can play a part into the quality of TV reception. The size and shape of the antenna can also determine how good your TV reception is. We’ll inspect all aspects of your antenna and TV reception to give you affordable solution for top Entertainment that won’t let you down. Want a more modern look for your entertainment area? Get your flat screen TV mounted to your wall with our handy help. We’ll supply the bracket that holds up your TV and fix it to your wall of choice. We’ll set up your home theatre to give you the best of TV right in your Home. We can set up speakers and wall mount TV’s to have your Home Entertainment just as you want it. We’ll install your Audio amplifier and give you a surround sound experience that will have you think you are in a cinema down town, all with the luxury of being at home with the coffee and snacks just in the other room. Multi TV walls are a great way to expand your TV Screen using 4 or more wall mounted TV Screens, These are a great option for TV Entertainment systems as the screen is projected 4 or more times bigger. We’ll install your TV wall ready for TV to PC software connection. We’ll setup your DVD or Blue ray CD player. Take out the complicated task and let us do it for you so we can simply tell you exactly what you need to do to watch High quality Movies at your home anytime. When you set up you Home Entertainment System you want to make sure you get all the effects possible including great sound. This requires good surround speakers with audio power amplifier’s to enhance the power of the audio signals output by the Surround Sound Speaker System. Great sound will give you the edge of your seat experience by watching movies and entertainment that are best watched with high output audio systems for that cinematic or theatre feel. We’ll provide receipt on purchase with manufacturers warranty. If you have a problem arise within warranty time you can rest assure that your product is going to get fixed. Most jobs are carried out on the same day, including antenna installation & repairs, where we can go the extra mile for our customers, covering “all areas of Adelaide” including a broad area of Metro Adelaide, Adelaide Hills, Gawler, Barossa and Yorke Peninsula. Analysis: We’ll Inspect your current set up and using industry safe tools so we can determine whether the problem can be fixed or if you need a new system set up! Implementation: We’ll then repair or install your new system using best safety measures as well as install for you state of the art high quality Antenna & Entertainment Systems. Result: We’ll then hand over to you fully enhanced TV quality to give you the entertainment solution you wanted from the start. Our smart deals include a full quote breakdown so you know exactly what you are paying for and we accept Cash, Cheque or EFTPOS. What’s more, you don’t have to pay a cent until the work is done and you are happy. Now that’s what we call a smart result! Call us on 0417 809 403 or “contact us online” for a quick, honest and fair quote. Need TV Antenna or Entertainment systems?